It was a special series for me personally as well as the team. All the players said that this is the most special win overseas. We have a young team and none of the team members had the experience of winning an overseas Test series. But at the same time we want to get better and stay at No.1. We don’t want to get carried away. When you landed in Australia, people were looking at Virat as the main batsman and suddenly you go and dominate the series. Did you see the attitude among the Australians change? Everything changed after the first innings (Adelaide). Whenever you go for a big tour, preparation is important. I prepared very well. Then I just tried to execute my skills and I knew what the bowlers could do because I had been there in 2014. I had faced Lyon, Starc and Hazlewood in 2014. Cummins was the only new addition to their bowling line-up. But I had faced him too in India in 2017. I knew their strategies and what line and length they would bowl. I just wanted to bat normally. We were in deep trouble in the first Test when we were 40 for 4. I thought something special is needed to win this Test and I knew that I just had to bat through the first two sessions and didn’t think about anything else. And when we lost Ashwin, I thought that I will have to accelerate at some point since I was batting with tail-enders and at least put up 200-plus. I was really pleased with the kind of shots that I played despite us being in trouble. You played more positively. Was it a conscious decision? From the 2014 Australia tour to the 2018 tour, what has been the journey like and what are the changes you have made to your game? It has been a different journey. I was inexperienced in 2014 and was on my first tour to Australia. We went to England and New Zealand too in 2014. All those series were my first series in those countries. Before that my first away series was in South Africa in 2010-11. Once you play in those conditions, you realize the changes that are needed. I made those changes over a period of time. I realized the mistakes I had made and worked hard to overcome whatever technical errors were there. Mentally I was very confident that I would do well because even in 2014, I batted well without getting the big scores. I was getting 30s and 40s and in one of the Tests in Australia, I even got an 80-plus, I just wanted to get past the 100-mark. Even in 2014, we put up a good show as a team, but we had never won a series. This time, even when we went to England we wanted to win the series, we played good cricket, but unfortunately we did not win. When we went to Australia, we were determined. There were two big away series in South Africa and England before, we were very sure that this unit can win away from home. Not my grip, but some changes to my stance and some other things. I don’t want to talk about them in interviews, because bowlers will prepare accordingly and plan. Do you feel your stance is more upright now because in the Duncan Fletcher era, your stance appeared more crouched and wide which was causing you and other team members, problems? There is a minor difference. My stance is pretty similar to what it was, but I have made some adjustments. In 2014, if I and the other batsmen failed, it was not because of the wide stance. Yes, Duncan Fletcher had his inputs. Some players liked it, others did not. It is obviously up to the individual to take the suggestion. There was no conflict. Your father Arvind was unwell during the Australia series and was undergoing a heart procedure. How tough was it for you to focus on cricket and block everything out? My father has been really supportive and is someone who really motivates me. He has always been there for me throughout my cricketing career. Before the surgery, our family doctor told me not to worry about anything and to just focus on cricket. Dr Patil was the guy who did his bypass five years ago. He assured me that there won’t be any complication in his procedure. My father too asked me to just focus on my game. I was lucky that my wife was there with him. She also told me to just focus on my game as we had an important game the next day. (Sydney Test). I was confident that he will be fine. But when I was walking in to bat on Day One, it was not easy. Subconsciously I was still worried and I was waiting for the end of the day so that I could quickly message my wife and check on him. I am glad I could still focus. I just watched the ball. Since I had scored runs before the fourth Test, I was confident and I just wanted to focus on batting. It was an important Test for the country. We had a chance to create history by drawing the Test or winning it. I had to be focused. Luckily, I am a tough cricketer mentally. Can you tell us how tough is it to play in Australia? You’ve been there twice now. They’re very strong. They’re well-aware of all the conditions … and their bowlers always have a very good plan to get the batsman out in their conditions. So, they’re well-prepared and they know what they’re doing. Even their crowd will always support their team. They’ll appreciate a good boundary hit by you, but not as much as what other people do in countries like England or South Africa. So their crowd is always behind their team. Yes…everything. Even their media is always supporting their team. if you make any error, they always let the opponents know. So, as an Indian player, if there’s something wrong, or even if there is a minor discussion in the team, and if their media-person gets to know, then they’ll always go behind that player. It’s part of their strategy, which we understand. Mentally you’ve to be tough. At the same time, there’s always a little bit of sledging which is going on. But luckily, I’m someone who doesn’t get affected. In fact, I get motivated when they try and sledge me. Do you remember any instance when the Aussies tried to intimidate you? If yes, how did you react to that? There were many instances. But I remember the first Test. Nathan Lyon and Tim Paine tried to sledge me. They almost felt that the game was over when we were 40 for four, or when we lost the wicket of Ash (Ravichandran Ashwin)..,they thought that we’ll be bowled out for 150-160. And even later on, I think in the third or fourth Test, they were trying to sledge me but at the same time they started laughing in the end. Lyon came and told me: ‘Aren’t you bored of batting now? You’ve scored so many runs.’ So, yes, they tried to sledge me initially, but then got friendly. Is that Lyon remark the best sledging comment that you’ve received? I wasn’t following any of their comments, especially when the series was going on. I got to know after the Test that he had said that. I had mixed feelings. Virat is a good player. Hazlewood probably said I’m a prized wicket because I was performing well. I had scored runs in Adelaide. I think he made that comment during the second Test in Perth. He had bowled against me even in India in 2017 and knew that getting me out was challenging. It was a special comment. But as a cricketer you have mixed feelings, because you also want your players to play well. After your amazing performance in Australia, where does all the talk about intent and strike rate go? If you look at this series, people have realized what’s required to perform well in Test cricket. Cricketing fraternity all over the world has started passing comments that this is how Test cricket should be played. People started appreciating the way I was batting, not just the Indian team management. Everyone has realized that there are different methods of playing this format. And because of white ball cricket, there’ve been players who’ve been playing many shots … they’ve been very aggressive. I still respect that because we still need players like Virender Sehwag, who’ve played Test cricket and still entertained people and scored runs for the team. So, there are different kinds of players, and each and every individual should be respected. You need to understand each and every player’s role. And when talk about intent and strike rate was going on, I just kept believing in myself, in my ability. I actually don’t get worried about what people are saying. Sometimes you just need to do the right thing for the team. When I’m playing for the Indian team, the most important thing is how I score runs and if I score runs, whether it’s helping the team or not. And if the answer is yes, you have to stick to your game. This mindset of batting on, where did you inculcate that? If I’ve won matches for any First Class team or the Indian team and contributed in a winning cause, you know that this is how games can be won, so you become even more confident. If you see Rahul Dravid, Sachin Tendulkar, VVS Laxman, they have been very classical. Obviously Tendulkar was a different player, he liked to dominate, but there have been other players who have played Test cricket the way it has been played. Even Tendulkar when the situation demanded, has scored just 50 runs in 150 balls, so there is nothing wrong in that. You just need to understand what situation you are playing in and bat accordingly. Sometimes you have to score a 100 at a strike rate of 80 or 90 if you are batting in the second innings and the team is planning to declare. In Test cricket you don’t get criticised if the team doesn’t win and if I have scored a 50 in 120, 130 or 150 balls. I don’t think that it’s a batsman’s fault. Because there is a lot of time in the game. We may not win because other batsmen haven’t scored runs or we haven’t bowled well. But it is not because I have taken so many balls to score my runs. If I get criticised, I would still take it because out of 10 times, I’ll win games 8 or 9 times. Not at all. Ultimately, he (Kohli) also understands what is required to win. Many times I’ve given him suggestions and he has been more than willing to accept them. He might have a different personality but that’s his nature and that is how he should be. There’s nothing wrong in that. He can behave the way he wants to as long as he respects the game. He hasn’t been disrespectful to anyone else. He is not someone who will go and abuse everyone, but yes, I mean, sledging is something which he likes at times. And there is nothing wrong in that as long as you don’t cross the boundary. He also respects my nature. I always enjoy batting with him and with all top-order batters. It is always good to have a good rapport with them. Someone like Ajinkya and Murali Vijay have played a lot of cricket with me. Playing with Virat is a special thing, and the way he plays his shots I think it’s remarkable. If you’re standing at the non-striker’s end, sometimes you just enjoy watching him play. When he’s at the crease, does the opposition think twice about sledging? Nowadays, opposition always wants to sledge whoever is there at the crease. When it comes to sledging, people wouldn’t think about that because they still want to get him out. Why do teams sledge? The reason is they want to get him out. So even if it’s Virat or me, or whoever is batting, I think they’ll try and say a few words. Obviously, they’ll just be careful of what they are saying. How do you manage to bat for long hours? Do you practise meditation for such high levels of concentration? I don’t meditate, but I have a routine. I pray every single day which helps me – it’s kind of a meditation. I also do yoga which helps me have a proper mindset. Yoga has helped me have a positive mindset. As a batsman, you should not have any thoughts. If you can have a blank mind, you can execute your skills better. Yoga has helped me to reach that stage where I’m thoughtless when I bat or even if I have thoughts, ensure that they are positive. How do you react when you see guys like Rishabh Pant playing the shots he does, or a Prithvi Shaw? Do you cringe, do you smile, do you tell them ‘thoda aaram se’? I laugh about it. Sometimes I get worried and say ‘what is he trying to do?’ But over a period of time, I’ve realized that you still need to respect them and their style because Pant has come from white ball cricket and we’ll have to give him some time to understand that if you want to play Test cricket, yes, you have to be attacking, which is his natural game, but at the same time, understand what is the right time to attack and when he cannot. That is what he has to figure out. If he’s battling with a tail-ender then it’s a different story, but if he’s batting with a top-five batsman, he might have to change his game a little bit and that is what I and the team management have tried communicating with him. Growing up, your dad was really strict with the way you played. Do you ever regret that being too technically correct has sometimes not helped you establish yourself in white-ball game? Not at all. My father always used to tell me to play according to the merit of the ball. And it’s not as if I wasn’t allowed to play any lofted shots. But he made sure that if I played a lofted shot, I had to execute it in a manner where it goes over the top. It should not just pop up in the air where someone can take a catch even in a practice session. Not many people have seen my white ball cricket and people have this perception. But the moment I play lofted shots, I always execute it in the manner where I get a four or a six. But in Test cricket it is not required as you are taking extra risk and risking giving your wicket away. You may end up scoring only about 30. But if you play down the ground you could end up with 150-160. If you can execute your shots then you should, but you should consider the chance of success. That’s important. If the chance of succeeding is less than you must curb your natural game and bat according to the situation. Who is the best bowler that you have faced and can you recall a particular spell where you found it really hard to survive? When I went to South Africa in 2010-11, Dale Steyn and Morne Morkel were at their peak. The way they were bowling, I was struggling, to be honest. That was the toughest bowling I have faced. There I realized what all I needed to succeed at the international level. There were some changes I had to make. The kind of swing Steyn was getting and the kind of pace and bounce Morkel was generating was very tough to negotiate. Your father has often spoken about how flawlessly he has seen you bat in the nets. It’s his one wish that the world should see you bat like that. Would you say your performance in Australia fits the description that your father talks about? Not completely. I have many more things to show the world. Obviously, I have been working hard on my game. I am still young and I am very sure that it will come at some point. What my father has been telling me has really motivated me. It gives me a lot of confidence because sometimes you start doubting yourself. But my father is the one who has always had faith in me and he told me that the world hasn’t seen you the way I have seen you. So don’t doubt yourself. At some point I thought because he is my dad he keeps motivating me then I started hearing things from other big coaches and then I feel what my dad is saying could be right. It could be technical also because sometimes I have seen many foreign coaches or Indian coaches say that what I am doing is technically perfect and I should not try and change anything. I try to communicate that with my father and try and tell him that what you have been telling me is right. But then he still tells me that I need to focus and not get carried away. Speaking about technique, coach Ravi Shastri recently said that you were left out of the Birmingham Test in England because there was a slight problem with your stance, something that can happen if you are playing continuously in county cricket. Can you recall if there was any such problem and how disheartening it was to be dropped for the 1st match of the series? I don’t discuss technical things much. The reason why I was not scoring many runs in county cricket were different. The kind of wickets I was playing on, if you look at the scorecard, the average score was 180-200 and even other batsmen didn’t score runs. There was one game where I was batting with Joe Root, Jonny Bairstaw and Adam Lyth who have played for England. Despite such a good batting line-up, we got bowled out for 50. When you look at such a line-up on paper, we were almost a Test team. We still won that game, but it was a challenging wicket. County cricket is different especially when you play for Yorkshire up north in April and May. The conditions are so challenging that you might not get a 50 but a useful 30-40 could be crucial. There were times I also got bad decisions which is part of this game and I accept it. If your time is not right people start thinking ‘oh, he hasn’t scored runs in county cricket.’ But people are not there to watch what is happening over there. It is very easy to say things from a distance. When I was dropped from the 1st Test, I was disappointed but at the same time I knew that my opportunity will come at some stage and I trusted my preparation because every player you asked would have vouched for the hard work I was putting in to succeed for Yorkshire. That helped me to play well in the next four Test matches. How has country cricket helped you? You are someone who has played a lot in England. Do you feel other Indian batsmen should be encouraged to play county cricket to improve their game? County cricket has been really helpful for me personally. Now whether it should be encouraged, I don’t know. I support it because if that’s done, it will be very good especially for our Test cricket. But when the IPL is going on most of our players are playing the tournament. And when IPL finishes it becomes difficult for players who are playing all formats because of workload issues. But if players who are just playing the Test format have time then I am sure they should go and participate in county cricket. Even white-ball specialists who aspire to play Tests should play in county cricket because it needs technique. Conditions are really challenging. Sometimes your weaknesses are exposed very quickly and then you can go to the nets and start working to rectify them. You came back from Australia and straightaway joined Saurashtra’s Ranji team. 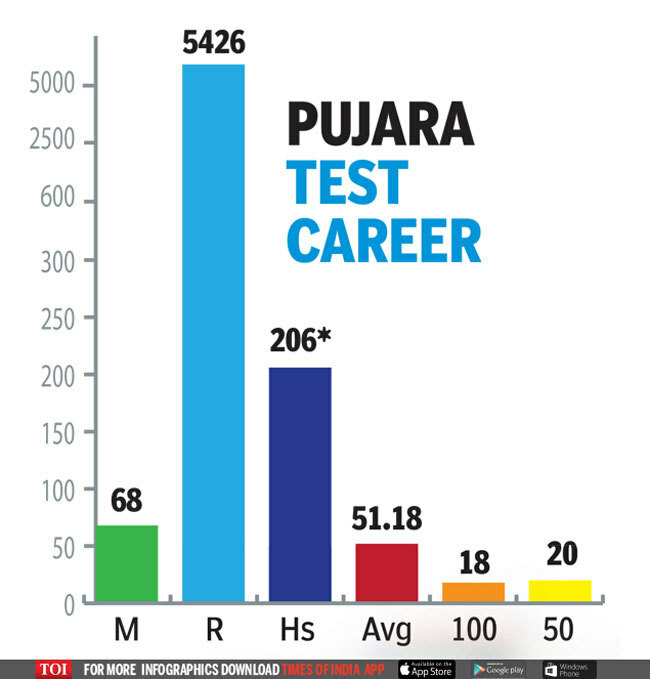 When you look at a regular domestic cricketer, do you see a “Pujara” around you? Do you see a player growing up with the kind of culture you have cultivated for yourself? I see many young talented players. I see a lot of commitment nowadays in domestic cricket. The importance of Ranji Trophy might have decreased a bit because of the IPL but at the same time I’ve seen many players who want to play Ranji, perform well, be recognized for the Indian Team whether it’s red ball or white ball cricket. A classic example is Mayank Agarwal and Vihari who have come from Ranji Trophy and performed well at the international level and when the team required it the most. The average fan outside thinks that players are only interested in playing the IPL..
It’s not the case but if you look at young players who are coming up, someone who is below 14 or 16, when you speak to them they might say that they want to play in the IPL. They won’t even say they want to play in the Indian team. So sometimes there are players who just want to be famous but majority of cricketers still want to play for the country. At the same time, IPL is a good league, but the preference should be to play for the Indian team and your state team. If you are good enough, you can play in Ranji Trophy, IPL and the Indian team. So there is much for Keery O’Keefe to come and see here. I heard it only 3-4 days later. I read somewhere later that he apologized and that he didn’t mean it. I hope it’s true. I believe that he was just trying to be a little funny and it wasn’t serious. There shouldn’t be any questions on Indian First Class cricket. Ranji Trophy is up there. After his comments, everyone came and spoke about Ranji Trophy and praised it. Was that a conscious move? Little bit because there were so many questions. It wasn’t a conscious effort but if the questions in a press conference are asked then you have to answer. Players know how valuable it is. There’s a lot of importance in Indian First Class cricket and at the same time a lot of players are coming from U-19 and India A and credit goes to Rahul bhai (Dravid). Did Rahul message you after the Aus tour? Yes, he messaged me and congratulated me for what I and the team achieved. Saurashtra have been very consistent over the past few years. What have you’ll done differently? Since the time me and Ravindra Jadeja’s made their debuts, players have realized that if they perform well for Saurashtra, they can play for the Indian team. So many young players got inspired by that. Jaydev Unadkat also came in. We have three players who are representing the Indian team. Players are working hard. Actually sometimes even I get inspired by their commitment to the Saurashtra team. The team culture and commitment is good and that’s why I always look forward to coming and playing for them. In the semis, you edged the ball but didn’t walk. That led to a huge debate. Did you feel bad about what happened? Sometimes I do, but at the same time, my focus is helping the team win the game. If I didn’t walk that doesn’t mean I disrespect anything. Sometimes you get bad decisions and you accept it and just move on. So it’s part of this game. There have been many occasions when we have got some players out and they haven’t walked. No one else notices it because he’s a domestic cricketer. But now since I’ve performed well and the matches are telecast, there was a lot of attention on the game so people started passing comments. When you started dating your wife (Puja), there were reports that she hardly knew the game. How are things now? When we got engaged, she did not know anything about cricket, she didn’t know I was. Her knowledge of the game has improved a lot and my father and she discuss the game a lot. As he knowledge has improved, she has become very supportive of the fact that I am a professional cricket player and I have to be away from home. I miss my daughter very much but with technology around, it is not very difficult because I can make a video call. But when I am around and especially when I am in Rajkot, I try and spend quality time with them, I don’t go out much and I try and look after Aditi because as a mother it is very difficult to manage Aditi on her own and as a father I believe I should always support her whenever I am around. Will you inculcate the same values in her like your father inculcated in you? Will you allow her to ride a cycle or as in your case, will you allow her to fly a kite. It is a tough call. But I will be little more balanced. I will be strict for sure. But at the same time, with all the knowledge, I can strike the right balance I have always had this argument with my father and ‘you don’t allow me to celebrate any festivals and if we have to go out, you don’t allow me because you feel I have to rest. Over a period of time, he also realized that you have to switch off somewhere. So It is important to have the right balance in life or as a professional sportsperson, you should be focused on the game but when there are no games, you need to have a hobby or play different sport. Now I play badminton, I play table tennis. It is important to have the right balance and that is what I will teach my daughter. Are you going to call Rishabh Pant for baby-sitting duties? Now we have a new member in the Saurashtra team, Jaydev Unadkat. He has taken over the duties. Now that I am committed to play more domestic cricket, he has promised to baby sit my daughter for a couple of hours. Let’s see whether he can. What’s your view on the Dukes vs SG vs Kookaburra issue? I think we should stick to the SG Ball in India because in our domestic cricket we play with the SG ball and the player gets used to playing with this ball whether it is the batsman or bowler. You know what it does with the new ball, with the old ball. So I don’t think we should change at all. The debate was on the quality of the ball. The BCCI has communicated with SG and during the semi-finals, we got a different quality of ball. They worked on it and it is much better now. I am sure the seam and shape is lasting a little longer and even the bowlers from the Indian team have communicated what they felt with the ball. Do you think the balls should be standardized? Not at all. I think the beauty of this sport is having different balls in different conditions. In England, we have the Dukes ball. You cannot play with the SG in England. In their domestic cricket they play with the same ball so they have a slight advantage. So if you are visiting a country, the question is how quickly you adjust to the different ball. That is the beauty of Test cricket. Let’s stick to these differences. In the Duleep Trophy you hit a century against the pink ball. Officially, the Indian team has not played with the pink ball in Test cricket. When do you think we should? We are still in an early stage to decide about the pink ball. In India, it is very difficult for a bowler to pick a wicket. Most of the times, teams have scored more than 500 runs which should not be the case. If you are playing the longer format of the game there has to be a balance. It can’t be a batter’s game. In white-ball cricket, it is a batter’s game and the bowlers do not have too many chances to pick many wickets. In the longer version, bowlers should have enough leverage to get a batsman out so when we start playing with pink ball, it reduced that. For the kind of pressures that a young cricketer is having these times, Rahul Dravid is advocating a backup cover. What is your take on it? I completely agree. Now when you see that the young generation is well educated, even the young cricketers are well educated, not just in India, but overseas too. If you are educated, it helps you think better in this game and education is something that I always loved. I am not a graduate, but I want to do an MBA at some stage. Because I am playing this game continuously, I am not able to study. I think once I retire or whenever I get time, I will go back to studies because that is something that I love. It is very important to have a backup in life for a sportsperson. Because if you have a basic degree or some level of education, then there is less pressure because if you fail as a cricketer you can always go back to doing what you studied. If you want to play, it should not be for survival, it should be for enjoyment of the game because you love the game. Do you think that is the case, domestic cricketers are playing for survival? I think so because most of the cricketers are from the middle class level although the financial structure or the match fees have changed, in domestic cricket and even Indian cricket. So if you look at them, they are mostly from the middle class background and that puts that extra pressure on success and when you have such pressures, you may not always succeed. The World Test Championships will begin later this year. Do you think it will revive interest in Test cricket? The Test Championships will begin when India tour the West Indies. How excited are you about this? Rahul Dravid also made a very important point about finance management for young players. They are looking at serious money. How do you draw a balance when faced with such a situation? Some monitoring should happen. I am not trying to say that they should be restricted with the money, but they should have the right guidance in life where they should understand that it’s not only about money. They should understand that focusing on how to manage money is also important. Once they start earning money and buying things, they should also think what if they are not as successful as what they are today. There has to be right planning and I am sure there are many corporate courses and the BCCI can think about guiding them too. There is a perception that India, with all the money they are pumping into the game is killing Test cricket. So are we killing Test cricket or are we the flag-bearers of Test cricket today? If you speak to any player in the Indian team and ask them about which format they like the most, all of them will say Test cricket. May be talent wise, they are not very successful in Test cricket but they will still say that this is the format that they would like to test themselves in. That is where the real challenge for a cricketer is and if they start performing in Test cricket, that is where the actual pleasure is. Because if you score a 100 in a Test and also in the shorter format, players will always say my Test 100 is always the more special one. The same goes for the bowlers. Yes, the game is moving on, there is a lot of white-ball cricket. Our ODI and T20 team is doing well in that. There’s nothing wrong, but at the same time there is a lot of respect for Test cricket in India as well. Should a player who plays only in Tests and does not play IPL get a higher contract? That will give players more incentive to play Tests? I agree. I have read things and I am assuming that that is the way forward to promote Test cricket. But at the same time, I also feel that First Class cricket and Ranji Trophy should be given more importance financially. I don’t know what should be the right structure, but players should get enough money even in domestic cricket because that is where Test cricketers are produced and if we can take care of players playing in Ranji Trophy well, then we will produce more Test players. The players too will focus on not just playing IPL, but focus on playing in Ranji Trophy and playing for India in Tests. You have also been motivated to turn up for Saurashtra? You came back from a tough tour of Australia and immediately played in Ranji. I always look forward to playing for Saurashtra because of the team atmosphere. Also, because that is where I started playing cricket. My roots belong there. I became a Test player just playing for Saurashtra. Whenever I get an opportunity, I never miss it. But now because I play a lot of matches, I have to look after my body, but I will always try and play for Saurashtra or any First-Class game. Are you a fan of Yo-Yo Tests? And what is your score? Yes. Yo-Yo Tests are good. My score is 17.5. Importance of fitness has increased overall across formats Yo-yo tests give you an idea of where you stand fitness-wise. If you are not working on your fitness, in the next Test you will find out that your score has decreased. Have you finally mastered the ra dance? No. I think Rishabh (Pant) was trying to do something and they forced me to do that and I couldn’t do that and ultimately it became the ra dance. How does it feel to be the most wanted batsman in Tests? It’s a great feeling when you are wanted in Tests. When you are liked about the purest format of the game, it’s a different feeling altogether. When players all over the world say that this is the format they love the most and if I am doing well in that, it is the proudest moment for me. It’s the best compliment I have ever heard in my cricketing career. Langer is someone I respect a lot He has brought in a lot of discipline to the Australian team, and although they were losing, he didn’t lose his temper. It is tough when Australia lose in Australia. Their team is going through a lot. I am very hopeful that he will take the Australian team upwards in the next couple of years.